Charleston, W.Va. – State Superintendent of Schools Dr. Steven Paine and West Virginia Department of Natural Resources (WVDNR) Director Stephen McDaniel signed a Memorandum of Understanding (MOU) today to expand a partnership that affords valuable work experience for students. The agreement provides opportunities for students with disabilities to enhance their leadership and technical skills to rejuvenate West Virginia’s State Parks. The MOU is an expansion of a current agreement between the two agencies that provides Career Technical Education students with real-world experiences. The expansion of this partnership will open doors for students with disabilities who often find it difficult to gain meaningful work experience. The new agreement will assist students in building the skills and confidence to successfully enter the workforce. 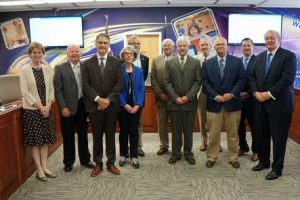 Last November, West Virginia Department of Education (WVDE) and WVDNR signed an interagency partnership that has already proven beneficial. Through the Simulated Workplace program, career technical education students have completed more than 500 restoration projects within state parks and gained the opportunity to apply the skills they have learned in the classroom in real-world situations. The project is housed within the WVDE’s Office of Special Education and will be implemented in Berkeley, Brooke, Clay, Calhoun, Gilmer, Hancock, Hardy, Lewis, Lincoln, Mason, McDowell, Mineral, Pocahontas, Roane and Wayne counties as well as the Schools for the Deaf and the Blind in 2018. The partnership will be expanded to 14 additional counties every year until all 55 are active.